This book contains the proceedings of the 2012–2014 Southeastern Lie Theory Workshop Series held at North Carolina State University in April 2012, at College of Charleston in December 2012, at Louisiana State University in May 2013, and at University of Georgia in May 2014. 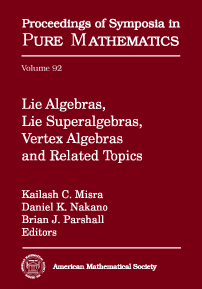 Some of the articles by experts in the field survey recent developments while others include new results in representations of Lie algebras, and quantum groups, vertex (operator) algebras and Lie superalgebras. Graduate students and research mathematicians interested in Lie algebras, Lie superalgebras, and vertex algebras.